The Halifax Mooseheads have produced some top-notch NHL talent over the last few years. 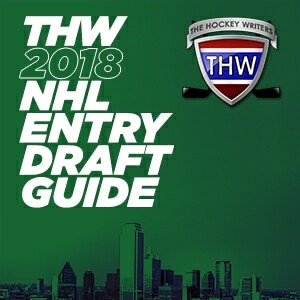 Some of the most notable examples include Nico Hischier (first overall in 2017), Nathan MacKinnon and Jonathan Drouin (first and third overall in 2013), Nikolaj Ehlers (ninth overall in 2014) and Timo Meier (ninth overall in 2015). That trend should remain steady this season with Filip Zadina primed to go early in the 2018 NHL Entry Draft. The winger has exceeded all expectations this season – an impressive feat. given how highly touted he was prior to ever stepping foot on a QMJHL sheet of ice. His combination of size, speed and skill make him an intriguing prospect who has all the makings of a star. His lateral movements and straight-line speed make him more than just a threat on offense, however, as he’s a potent penalty killer too. From start to finish, Zadina made the best of the 2017-18 regular season in Halifax and has only bolstered opinions of him leading up to the draft. 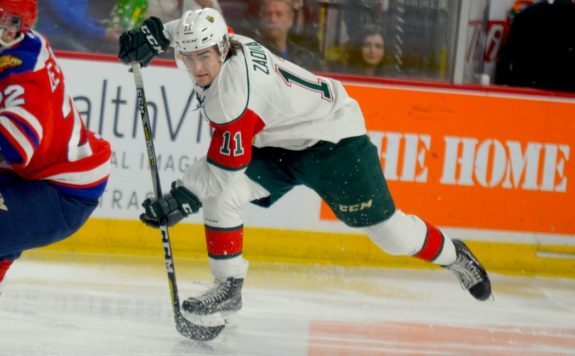 Scoring a very impressive 44 goals and 82 points in only 57 games with the Mooseheads in his rookie season in the QMJHL, Zadina quickly showed everybody exactly what he was all about. From his size and strong skating ability to his skill and elite shot, Zadina has a tendency to make plays that can wow even the most avid hockey fan. Zadina also made an impact at the World Junior Championships in Buffalo while representing the Czech Republic. Scoring seven goals and eight points in seven games, he stepped up and then some. With that said, there are certain things that Zadina will have to work on at the next level. The most glaring being the fact that his decision-making could use some work. His puck control is generally very good but his tendency to hold onto the puck for a little too long has gotten him into trouble at times. Whether it be a forced turnover against Zadina or a missed scoring opportunity, the winger will need to work on those decisions to make a real impact at the next level. It’s rare to find a player so consistently ranked in draft projections. Zadina, however, has been ranked as the No. 3 prospect from the beginning of the season until the very end with only Rasmus Dahlin and Andrei Svechnikov ranked higher. With that in mind, Zadina’s most likely draft position will be third overall in 2018. There have been people who have talked about Zadina going as high as second overall, however, so that will be something to watch for as well. There’s no doubt that Zadina has the potential to be a top-line winger if he reaches his full potential at the NHL level. He’s already so refined that he could make an impact as a top-six forward as early as next season depending on where he’s drafted and how well he performs out of training camp. Zadina recorded the most goals by a rookie in the QMJHL (44), most assists (38) and most points (82) while also making the U20 WJC All-Star Team in 2017-18.